Since most merchant vessels are mainly influenced by the added resistance in an actual sea, they could be navigated moreefficiently if this added resistance could be precisely predicted and then effectively reduced. In this paper, we have computed theeffective horsepower based on the resistance performance in still water and then calculated the added resistance in regular wave inorder to estimate a ship's propulsion performance on a voyage. Firstly, we have performed experiments using a model of KCS in acirculating water channel to estimate the flow characteristics around a container ship and the ship's resistance in still water. Then wehave calculated the motion response function in regular wave as well as the values for the increase in resistance, and evaluated theship's motion performance in waves according to the calculated response function. It was found that the resistance in waves increasedbecause the ship's motion response value became larger as the ship's speed increased in the case of head sea. The effect of the addedresistance could be reduced by maneuvering the ship to the encounter angle of 120° in areas of long wavelengths and to head sea inareas of short wavelengths. In navigation in an actual sea environment, the resistance against a ship increases because of the wind or waves, in addition to the wave-making resistance and viscous resistance produced in still water. Since most merchant vessels are mainly influenced by this added wave resistance, they could be navigated more efficiently if this added resistance could be precisely predicted and then effectively reduced. Faltisen et al. (1980) derived an asymptotic formula for small wave lengths. Nakamura et al. (1983) performed an experiment on the diffraction conditions that impact the added resistance in short waves. Naito et al. (1985) proposed a formula based on the ray theory and numerical simulations. Takahashi(1988) revised his proposal and offered a semi-empirical formula for the added resistance due to the wave reflection. Theoretical and experimental investigations have been conducted for the added resistance with respect to various types of ships(Ahn and Lee, 2010; Hong et al., 2001; Kashiwagi et al., 2000). 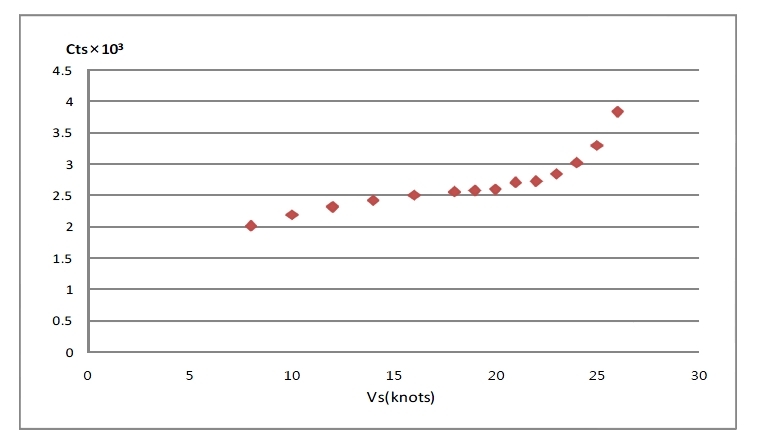 In this paper, we have computed the effective horsepower based on the resistance performance in still water and then calculated the added resistance in regular waves in order to estimate a ship's propulsion performance on a voyage. Therefore, it might be necessary to use these data to evaluate the possibility of a ship's safe navigation. If it were possible to figure out in advance the characteristics of the resistance performance of a container ship that would be representative of the majority of types of ships with high fuel consumption, it would be possible to implement effective sailing management through the estimation of the exact added resistance in waves. It is anticipated that using such an approach, greenhouse gas emissions could also be controlled effectively. For this study, we selected a KCS (KRISO Container Ship) 3600TEU, whose form is regarded as being highly practical modern container ship as compared with the hull form of container ship in the 1970s that the flow measurement data were available for this ship. 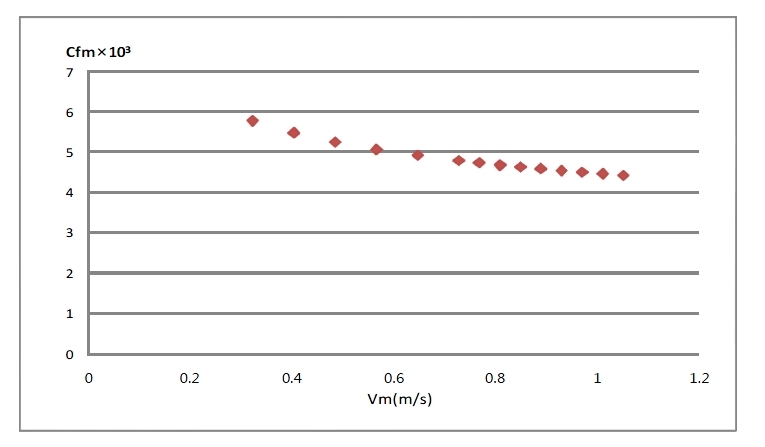 Firstly, we have implemented the experiments using a model in a circulating water channel for estimating the flow characteristics around a container ship and propulsion performance. We also compared the resistance on the container ship and the effective horsepower of an actual ship and we examined the hull wave profiles for different speeds through the experiment. Based on the above mentioned data, we analyzed the resistance and propulsion performance of a container ship and the characteristics of the flow field around its hull. We calculated the container ship's motion response function in regular waves and the added resistance, and then evaluated its motion performance in waves according to the calculated response function. It was found that the resistance was greater in waves than in still water. This fact is the result of the waves produced by the ship's motion and the diffraction of incident waves occurring because of reflection of the waves against the hull. The exact estimation of a ship's increased resistance in waves is a very important factor in evaluating its propulsion performance in an actual sea. Therefore we have investigated the characteristics of the added resistance to navigate efficiently. To estimate the resistance performance of a container ship, we performed the experiment with a model in which we observed the resistance and hull wave profiles in a circulating water channel. The model used in this study was a KCS 3600TEU that was manufactured on the reduced scale of 1/161.74. We experimented with this model in a circulating water channel with dimensions of 10.0m×1.5m×4.0m in order to estimate the resistance performance of a container ship. Table 1 lists the main details of the ship's specifications. We decided upon the design speed of 24kts and then implemented the experiment in the speed range of 8kts~26kts. Then we compared the resistance characteristics for different speeds. Fig. 1 shows the result of total resistance and residual resistance coefficient of model in comparison with other institute. 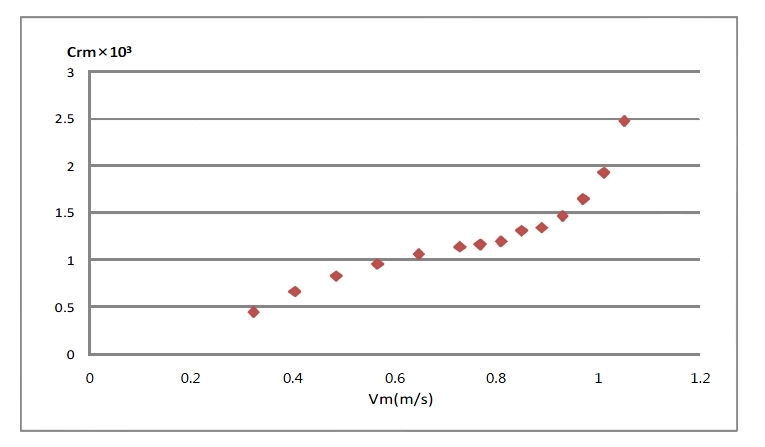 The measured value of the total resistance on the model is shown in Fig. 2; the total resistance coefficient, Fig. 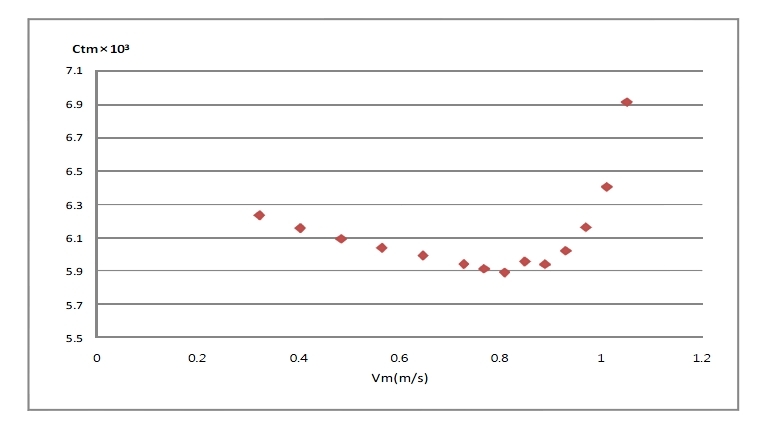 3; the frictional resistance coefficient, Fig. 4; the residual resistance coefficient, Fig. 5; the total resistance coefficient of the actual ship, Fig. 6; the frictional resistance coefficient of the actual ship, Fig. 7; the total resistance of the actual ship, Fig. 8; and the effective horsepower of the actual ship, Fig. 9. 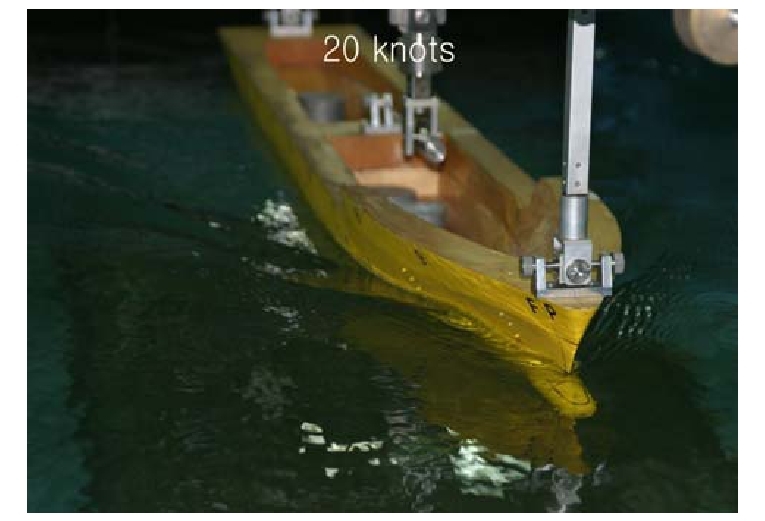 We notice that the results obtained by this study are larger than those of the others because the flows around the model ship become laminar flow at the same Fn due to the low Rn in this experiment. Thus the frictional resistance coefficient becomes relatively larger, and it is considered that the wall effect is affecting to the increase of total resistance coefficient. 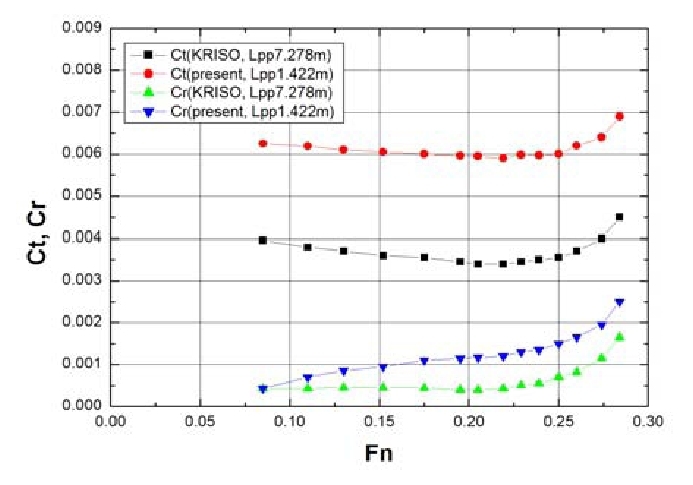 The result of KRISO shows that the wave-making resistance is very small and the total resistance consists of mainly the frictional resistance at the low speed areas. 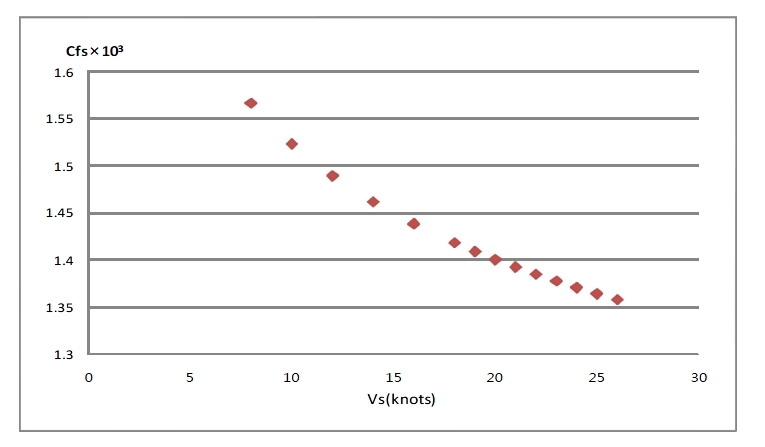 This study's interpretation was performed by applying the ITTC-1957 friction line to estimate the actual ship resistance. 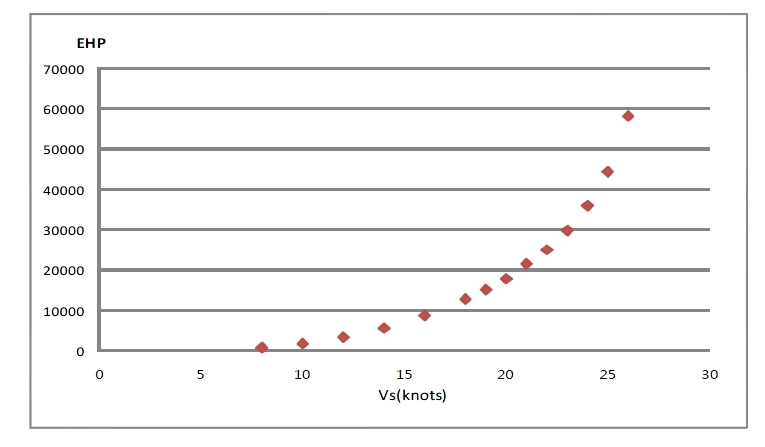 It was found that as the speed increased, the total resistance coefficient value of the model ship tended to decrease gradually until the speed reached 20kts, but then increased after 21kts. This tendency produces a figure similar to the residual resistance coefficient shown in Fig. 5. In other words, we determined that at higher speeds, the resistance performance of a container ship is greatly affected by the wave-making and eddy-making resistance, rather than the frictional resistance. According to the curve of the effective horsepower of the actual ship, which is shown in Fig. 9, the horsepower increased by 100.7 percent at the design speed of 24kts, while the horsepower rose by 39.6 percent at 22kts rather than at 20kts. In order to select a ship's optimal speed, it is necessary to comprehensively consider many factors such as the sea conditions, fuel consumption, and reserve horsepower. The hull wave profiles of the model ship are shown in Fig. 10(for 16kts), Fig. 11(20kts) and Fig. 12(24kts). Phenomena such as double wave heights were observed near the bow at 24kts. At the same time, since the wave height at the stern was controlled by the transom effect around the stern, it was observed that the increase in waves was controlled. It is estimated that the increase of residual resistance which consists of wave-making resistance and eddy-making resistance derives from these wave profile. Other diverging and transverse waves displayed wave pattern shapes that were typical for a container ship. The resistance of the model container ship in waves was greater than in still water. This fact is the result of the waves produced by the ship's motion, and the diffraction of incident waves that take place because of their reflection against the hull. 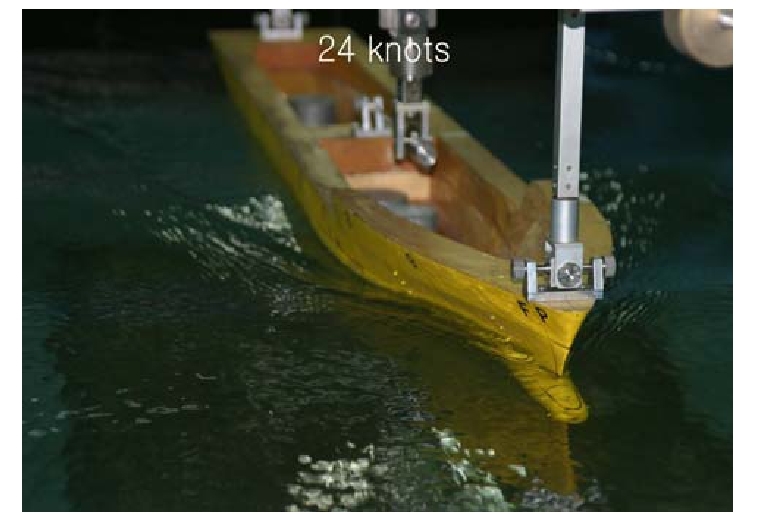 The exact estimation of a ship's increased resistance in waves is a very important factor in evaluating its propulsion performance in an actual sea. In this study, we investigated and analyzed the characteristics of a ship's increased resistance in regular wave by carrying out calculations for a container ship that is widely used in practical circumstance. We used the NSM(New Strip Method) in accordance with the strip theory to determine the ship's motion response function and the simplified calculation method proposed by Takagi(1991) for the added resistance in waves. Fig. 13 shows the coordinate system used in this study. First, the simplified formula for the increase in resistance in waves, drawn from Maruo and Iwase(1980), is expressed as follows. where is the encounter angle of wave, and  is the wave number. Here Hn(m) is called the Kochin function, which is calculated using the following formula because the singularity distribution is distributed on the axis, based on the assumption of a slender body. With the use of the above formulas, there is a tendency for the accuracy of the results to be limited when the wave number of encountered wave in the following seas is small. Therefore, Takagi suggested the following simplified formula to improve the accuracy in calculation for following seas. Equation (7) is used in case the wave number of encountered wave is large, while the equations below are used to calculate the added resistance when the wave number of encountered wave is small. Fig. 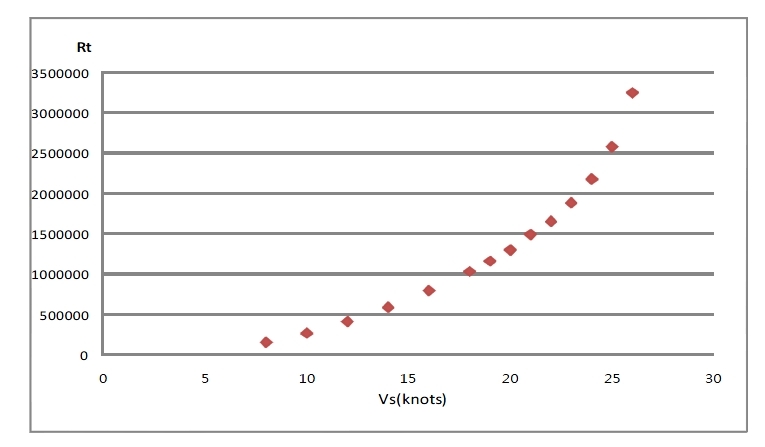 16 shows the non-dimensional value of the added resistance for the different ship speed at same encounter angle, while Fig. 14 and Fig. 15 show the motion response amplitude of heaving and pitching of the container ship. Fig. 17, Fig. 18, and Fig. 19 show the values for the heaving, pitching, and added resistance for the different encounter angle of the waves, respectively. Fig. 14, Fig. 15, Fig. 16, Fig. 17, Fig. 18, and Fig. 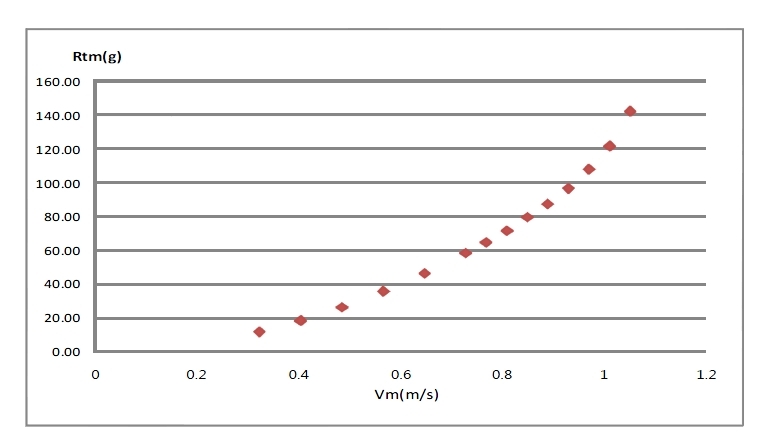 19 show the comparison of the non-dimensional values of heaving, pitching, and the added resistance according to the ratio of the wavelength and Lpp in terms of the speed and encounter angle. In particular, the added resistance expresses the nondimensional value as pgA2(B2/L). "A", "χ", and "k0" denote the wave amplitude, encounter angle of the wave, and wave number, respectively. When the encounter angle of the wave was 180°, it was found that the ship's motion response value for heaving and pitching, and accordingly, for the added resistance increased as the ship's speed increased from 16kts to 20kts, 24kts and 26kts. As the ship's speed sharply decreased to 16kts from 26kts, the added resistance decreased by about 50 percent. In general, the added resistance tended to decrease in correspondence to the decrease in the ship's speed. When the speed was reduced from 26kts to 20kts, heaving and pitching were sharply decreased, but there was no significant difference in the added resistance, as compared with the reduction in speed to 24kts. As regards the effect of the encounter angle, heaving showed the largest value at 120°, whereas pitching showed the largest value at 180°. The added resistance showed the largest value at 150°. The added resistance increased at the encounter angle of 180° in the case of a long wavelength and at the encounter angle of 120° in the case of a short wavelength. In other words, it was found that the effect of the added resistance could be reduced by maneuvering the ship to the encounter angle of 120° in areas of long wavelengths and to head sea in areas of short wavelengths. In this study, we have performed the experiments using a model in a circulating water channel to estimate the flow characteristics around a container ship and the ship's resistance in still water. Then we have calculated the container ship's motion response function in waves as well as the values for the increase in resistance, and evaluated the ship's motion performance in waves according to the calculated response function. We obtained the following conclusions by analyzing the results of experiment and computation. It was found that the resistance in waves increased because the ship's motion response value became larger as the ship's speed increased in the case of head sea. When the encounter angle of the wave was 180°, it was noted that the ship's motion response value for heaving and pitching, and the added resistance increased as the ship's speed increased from 16kts to 20kts, 24kts and 26kts. As regards the effect of the encounter angle, the added resistance showed the largest one at 150°. The added resistance increased at the encounter angle of 180° in the case of a long wavelength and at the encounter angle of 120° in the case of a short wavelength. The effect of the added resistance could be reduced by maneuvering the ship to the encounter angle of 120° in areas of long wavelengths and to head sea in areas of short wavelengths. This research was supported by Basic Science Research Program through the National Research Foundation of Korea(NRF) funded by the Ministry of Education, Science and Technology(2011-0025046). 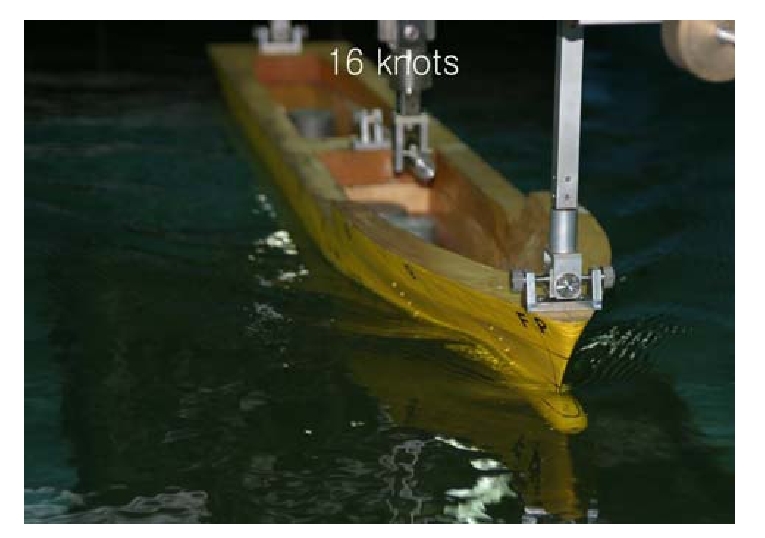 1.Ahn, B. K. and Lee, S. M.(2010), "Study on the Added Resistance of Barge in Waves", Journal of Navigation and Port Research, Vol. 34, No. 10, pp. 741-746. 2.Faltinsen, O. M., Minsaas, K. J., N. Liapis and Skjordal, S. O. (1980), "Prediction of Resistance and Propulsion of a Ship on a Seaway", Proceeding of 13th Symposium On Naval Hydrodynamics, pp. 505-529. 3.Hong, D. C., Hong, S. Y. and Kim, E. C.(2001), "On the Calculation of Added Resistance of a Ship by Maruo's Formula", Proceeding of the Spring Conference of the Korean Society of Ocean Engineers, pp. 202-207. 4.Kashiwagi, M., Kawasoe, K. and Inada, M.(2000), "A Study on Ship Motion and Added Resistance in Waves", Journal of the Kansai Society of Naval Architects of Japan, No. 234, pp. 85-94. 5.Maruo, H. and Iwase, K.(1980), "Calculation of Added Resistance in Oblique Waves", Journal of the Society of Naval Architects of Japan, Vol. 147, pp. 79-84. 6.Naito, S., Nakamura, S. and Nishiguchi, A. (1985), "Added Resistance in Short Length Waves on Ship Forms with Blunt Bow", Journal of the Kansai Society of Naval Architects of Japan, Vol. 197, pp. 39-45. 7.Nakamura, S., Naito, S., Matsumoto, K., Susukida, K. and Nishiguchi, A. (1983), "Experimental Study on Resistance Increase in Regular Head Waves of a Ship with Blunt Bow", Journal of the Kansai Society of Naval Architects of Japan, Vol. 190, pp. 73-81. 8.Takagi, K.(1991), "Simplified Formulas for the Calculation of Added Resistance, Steady Lateral Force and Turning Moment in Waves", Journal of the Kansai Society of Naval Architects of Japan, No. 216, pp. 121-128. 9.Takahashi, T.(1988), "A Practical Prediction Method of Added Resistance of a Ship in Waves and the Direction of its Application to Hull Form Design", Transactions of the West-Japan Society of Naval Architects, No. 75, pp. 75-95.